Neurologists, especially the senior ones, who got a chance to practice in the older times, have all seen patients diagnosed as herpes encephalitis who surprisingly failed to respond to anti-viral therapy despite the latter's excellent efficacy profile. With the advent of magnetic resonance imaging (MRI), the characteristics of herpes encephalitis were so clearly defined that the sub-acute onset of symptoms were ignored; more so because HSV encephalitis may rarely have a slow progression of symptoms. Laboratory findings were often ignored as the virus along with its antigens was well known to disappear from the cerebrospinal fluid in the early stage of the disease. Moreover, patients with sub-acute onset would seek medical attention a little late. We remember losing many such patients. Even an inadvertent use of steroids (a practice of that time in some of the undiagnosed cases) could have saved them, but steroids were forbidden in herpes encephalitis. Little did we realize then that the central nervous system could also be a target for slow immunological processes, though a somewhat similar clinical counterpart existed in the peripheral nervous system in the form of chronic inflammatory demyelinating polyradiculoneuropathy (CIDP). Our concept of autoimmune involvement of the brain or spinal cord was at the time, confined to acute single or recurrent affliction in the form of acute disseminated encephalomyelitis (ADEM) and multiple sclerosis (MS). The term neuromyelitis optica (NMO) did exist even at that time, i.e., much before the discovery of anti-aquaporin 4 antibody but it had a different connotation vaguely related to collagen vascular disorders. The actual NMO of the present time, which is primarily related to this newly discovered antibody, must be existing at that time, but now retrospectively, we all may agree that this entity was described by several authors of that time as “an Indian variety of multiple sclerosis”. Some people (including the first author of this article) did realize that this entity is different from ADEM, MS and the older definition of NMO (which required spinal cord and optic nerve or both optic nerves to get involved within a period of one month) and described the condition as an unknown but a distinct entity. The past decade has seen the emergence of several antibodies targeting different segments of neuronal cells, producing nearly identical sub-acute onset brain syndromes. All neurologists are observing this syndrome of “immune encephalopathy” with keen eyes as it is evolving with the discovery of more and more antibodies with every passing year, more so because these are responsive to different immunotherapies. Autoimmune encephalitis (AE) is fast emerging as the major cause of non-infectious encephalitis. As happens with any new entity, guidelines for the diagnosis of AE are based on the antibody positivity and response to immunotherapy. However, looking back into the history of evolution of various syndromes, we have learnt that the major guiding force behind their label as a single entity or as a cluster of entities is the treatment option available for them. In case the management demands an urgent institution of a particular therapy, then the prior confirmation of disease also becomes necessary. In this context, Graus et al., have modified the guidelines in their position paper in which they have divided the entity of AE into definite, probable and possible. Only definite AE (with the exception of limbic encephalitis) requires the positivity of antibodies while probable and possible AE are to be diagnosed by a set protocol of clinical features with magnetic resonance imaging of the brain (MRI), electroencephalography (EEG) and cerebrospinal fluid (CSF) analysis. Due to this division, the diagnosis of AE remains quite confusing. From the experience that we, the authors, gained through some of the patients with AE that we treated in the previous few years, and from the experience of others in this field, we reach to a conclusion that AE is such a disease that needs immediate attention to prevent permanent sequalae. For its early management, however, a quick but reasonable diagnosis is required. To give some insight to what we wish to propose, we analyzed 13 patients of encephalitis, whom we saw in the last one year, and in whom a “presumptive” diagnosis of AE was made on the basis of commonly known symptoms [Table 1] of the disease with the specific purpose of instituting immune therapy. AE mimics were ruled out by appropriate investigations. CSF samples for antibodies against NMDA- NR1, α-amino-3-hydroxy-5-methyl-4-isoxazolepropionic acid (AMPA) - GluR1 and GluR2, gamma amino butyric acid (GABA- A and B), voltage gated potassium channel (VGKC with LGI1 and CASPR2), glutamic acid receptor (GAD) and paraneoplastic panel consisting of anti Hu, anti-Ri, anti- Yo, anti- Ma2/Ta, anti- CV2/CRMP-5 and anti- amphiphysin were sent. The immunotherapy in the form of daily steroids or monthly IVIg for at least three months was started without waiting for the confirmation report of either the presence or the absence of the representative antibody. All the “presumptive” AE patients were classified into already known categories like possible, probable and definite AE after one year of prospective follow-up. The flowchart of methodology has been depicted in [Figure 1]. There were 13 patients (9 males) of whom four belonged to the pediatric age group of less than 18 years. The mean age of presentation was 40.8 years (with the range being 1.1-71 years). The mean duration of neurological deficits was 2.7 months with the range being between 20 days to 8 months. Most of the cases presented sub-acutely, except one nine-year-old child who had an acute course of focal seizures with generalized dystonia of 20-day duration. The predominant clinical presentations were sub-acute onset behavioral disturbance, dementia and seizures (that were present in 9 out of 13 patients). The cerebellar syndrome and hyper-somnolence were present in two patients, while irritability, hyperactive behavior and altered sensorium were observed in the remaining two. One patient with the predominant manifestation of seizures also had dystonia, while another had associated developmental regression. Psychiatric abnormalities like persistent and excessive laughing and irrelevant talk were present in one patient with seizures and in one patient with dementia. The MRI of the brain was essentially normal [Figure 2] in eight patients (61.5%) while it was abnormal in five (38.5%) patients. Four had bilateral/unilateral medial temporal lobe hyperintensity while one had diffusion restriction in bilateral frontal cortex. The cerebrospinal fluid (CSF) analysis was done in 12 out of 13 patients. Seven (58.3%) patients had an abnormal CSF finding, of which 4 had only elevated protein, one had elevated cells, while two had both elevated protein and cells. The electroencephalogram (EEG) was abnormal in three patients with delta slowing in two patients and a delta brush pattern in one. The lone patient in whom the EEG was showing a delta brush was positive for the NMDAr antibody. Six patients were treated with IVIg, five with steroids and two with IVIg followed by steroids. One patient of AE was positive for anti-Yo antibody and had primary lung cancer that was treated accordingly. The autoimmune antibody panel from the CSF/serum was positive in six (46.1%) patients. All of the patients improved significantly in their symptoms. Two patients died of sepsis nearly three months after being discharged. None of the patients had a relapse in the next one to two years of follow-up. Based on sub-grouping done previously by other authors, seven patients were classified as definite, four as probable, and two as possible AE. The minimum age of presentation in our study was 14 months. The youngest child had facio-brachial seizures along with developmental regression in all domains. Facio- brachial seizures have been exclusively described in association with VGKC-AE. Confusion, memory impairment, focal seizures and status-epilepticus have been described in various cases of VGKC-AE but not the developmental regression. On the contrary, only five NMDA-AE patients with developmental regression have been described in the literature.,, As facio-brachial seizures are exclusively described with VGKC-AE and developmental regression with NMDA-AE, the presence of both these clinical features in one patient suggests either a rare manifestation of developmental regression in VGKC-AE, or of facio-brachial seizures in NMDA-AE, or else, this could be a case of AE associated with some yet unknown antibody. Similarly, one more child in our cohort had facio-brachial seizures although she had anti-NMDAR receptor antibodies positive in CSF. Rest of the presentations like dementia, cerebellar syndrome or movement disorders, as seen in our cases, have been commonly reported in different AEs in various combinations. The CSF analysis was abnormal in 53.8% (7 out of 13) of our patients. Increased protein or cells was the most common abnormality on routine examination. The antibody panel was positive in 6 out of 7 cases of abnormal CSF while only one was positive among cases with normal CSF. Previous studies describe 69% to 95% of patients having abnormal CSF findings in proven NMDA encephalitis cases. Patients with LGI1 antibodies have been reported to present with a lower frequency of CSF pleocytosis (41%) or elevated CSF protein concentrations (47%). Our finding of 53.8% cases with an abnormal CSF was in concurrence with abnormal CSF findings in around 50% cases of VGKC limbic encephalitis. The CSF findings of AE other than NMDA have been poorly reported. Elevated IgG index or oligoclonal bands are reported more commonly in patients of antineuronal antibodies or anti-GABA-B/AMPA receptor encephalitis.,, These tests were not done in our cases due to financial issues. Various reasons have been put forward by experts for the negativity of antibodies even in presence of AE. These include antigen denaturation during tissue fixation, false-negative results caused by a small amount of antibody, differences between human and mouse epitopes, and the presence of T-cell-dominant autoimmune encephalitis. On the contrary, it has been seen that antibodies like anti-Hu antibody in small cell lung cancer, anti-TPO antibodies in Hashimoto's encephalitis, anti-VGKC antibodies in Miller-Fisher syndrome and Bickerstaff encephalitis, anti-GAD antibodies in 80% of type 1 diabetes mellitus, are often the bystanders and possibly non-pathogenic. Therefore, negative or positive antibody panels should be interpreted in the light of clinical findings. Epilepsy has been found to be so common in AE that epileptologists have invented the term “autoimmune epileptic encephalopathy” to denote those types of AE which primarily present with seizures that are often intractable. Though this term by default also includes several other epileptic syndromes which have possible autoimmune etiology, but primarily, the focus of this term is on AE related cases. In this context, the findings on EEG of these patients is of paramount importance. EEG has been reported to be abnormal in 75%-90% cases of NMDAR encephalitis., The percentage of EEG positivity in different categories of AE has not been separately reported. Electroencephalographic abnormalities were seen in 23% of our patients. We had only one patient of NMDAR- AE. This might explain the low positivity of EEG in our cases. In a recent study on suspected autoimmune epilepsy, it was concluded that a possible autoimmune etiology for seizures may be considered in the presence of continuous slow waves, frontal intermittent rhythmic delta activity (FIRDA), and delta brush pattern on the EEG findings. However, these findings do not help in differentiating encephalitis of a possible autoimmune etiology from other encephalitides. Our patients with EEG findings had either delta slowing or rarely delta brush pattern, which were consistent with AE. A previous study from Mayo clinic showed a normal initial MRI in 66% patients of autoimmune encephalitis whose seizures responded to immunotherapy. In our study, the MRI of the brain was normal in 61.5% patients. In the study from Mayo clinic, 5 of 12 patients with a normal MRI had a positive second MRI after a median duration of 4 months. This finding reiterates the role of “presumptive” diagnosis in clinically suspected patients with AE in whom the known etiologies have been fairly excluded by other modes of investigations. In practice, various neurological deficits in AE are less commonly recognized due to their non-specificity. Some clinical features like sub-acute onset, resistant seizures, intra-individual variability of seizure semiology, past or family history of neoplasia or other autoimmune disorders, may provide a clue to the autoimmune nature of the etiology. A comprehensive antibody panel is recommended, as none of the antibodies are specific for any particular symptomatology. Even if the autoimmune antibody panel is negative, a trial of immunotherapy for 6-12 weeks may be given if other supportive evidences of autoimmune etiology exist, or if other treatment options are not available. The fact that 44% of patients who are rituximab responders have AE without detectable antibodies, reiterates that suspected cases of AE should always be given a trial of immunotherapy. All our patients had initial improvement in symptoms with immunotherapy, though two died of sepsis two and three months after their discharge from the hospital. None of our patients required second line immunotherapy like rituximab or cyclophosphamide and none relapsed during the follow-up period of one year. This may be due to the fact that most of our patients presented early with a median duration of illness of 2.7 months (20 days to 8 months) and all were treated presumptively pending their investigation report. It is a well-established fact that early immunotherapy improves clinical outcomes., In this context, an early clinical diagnosis is mandatory irrespective of the investigations performed, as the autoimmune panel is not yet a highly sensitive and specific diagnostic tool. It is highly likely that we are identifying and treating the more severe forms of AE, and a big chunk of the iceberg is still buried under. Clear guidelines regarding when to take the sample for AE work-up have not been established, and this requires the determination of the timing of peak antibody levels in various types of AE. In the light of above mentioned facts and findings from our own experience, we feel that the use of specific immunotherapy in suspected cases of AE should be validated, as it has been proven that early immunotherapy decreases morbidity and improves outcomes.,,,, We propose that all clinically suspected cases of autoimmune encephalitis based on already known symptoms [Table 1], should be taken as “presumptive” AE after ruling out other mimickers. The EEG, MRI [Figure 3] and CSF findings can probably support the “presumptive” diagnosis. If the assessment of the antibody panel shows positivity, the label should be changed to “definite” AE. This division into only “presumptive” and “definite” can probably make our job simpler. It is futile to wait for dividing cases into “definite”, “probable” or “possible,” with complex diagnostic algorithms for each one, as it does not have a bearing on the first-line treatment. All the cases whom we have treated improved and none showed immunotherapy related adverse outcome in the one to two year follow-up period. As the symptoms of AE are more general rather than specific to any one variant (except a few), it is better to make a symptomatology-based diagnosis. Making a “presumptive” diagnosis of AE and starting early immunotherapy is likely to improve the chances of a good recovery. Keeping this view in mind, chasing the label of a specific diagnosis before starting the treatment seems a rather unyielding exercise for the time-being. Pradhan S, Mishra VN. A central demyelinating disease with atypical features. Multiple Sclerosis 2004;10:308-15. Zuliani L, Graus F, Giometto B, Bien C, Vincent A. Central nervous system neuronal surface antibody associated syndromes: Review and guidelines for recognition. J Neurol Neurosurg Psychiatry 2012;83:638-45. Tardieu M, Deiva K. Rare inflammatory diseases of the white matter and mimics of multiple sclerosis and related disorders. Neuropediatrics 2013;44:302-8. Irani SR, Stagg CJ, Schott JM, Rosenthal CR, Schneider SA, Pettingill P, et al. Faciobrachial dystonic seizures: The influence of immunotherapy on seizure control and prevention of cognitive impairment in a broadening phenotype. Brain 2013;136 (Pt 10):3151-62. Haberlandt E, Bast T, Ebner A, Holthausen H, Kluger G, Kravljanac R, et al. Limbic encephalitis in children and adolescents. Arch Dis Child 2011;96:186-91. Kim SY, Choi SA, Ryu HW, Kim H, Lim BC, Hwang H, et al. Screening autoimmune anti-neuronal antibodies in pediatric patients with suspected autoimmune encephalitis. J Epilepsy Res 2014;4:55-61. Hacohen, Y, Wright, S, Gadian, J, Vincent, A, Lim, M, Wassmer E, Lin, JP. N-methyl-d-aspartate (NMDA) receptor antibodies encephalitis mimicking an autistic regression. Dev Med Child Neurol 2016;58:1092-4. Maggio MC, Mastrangelo G, Skabar A, Ventura A, Carrozzi M, Santangelo G, et al. Atypical presentation of anti-N-methyl-D-aspartate receptor encephalitis: Two case reports. J Med Case Rep. 2017;11:225. Lim JA, Lee ST, Jung KH, Kim S, Shin JW, Moon J, et al. Anti-N-methyl-d-aspartate receptor encephalitis in Korea: Clinical features, treatment, and outcome. J Clin Neurol 2014;10:157-61. Jarius S, Hoffmann L, Clover L, Vincent A, Voltz R. CSF findings in patients with voltage gated potassium channel antibody associated limbic encephalitis. J Neurol Sci 2008;268:74-7. Gultekin SH, Rosenfeld MR, Voltz R, Eichen J, Posner JB, Dalmau J. Paraneoplastic limbic encephalitis: Neurological symptoms, immunological findings and tumour association in 50 patients. Brain 2000;123:1481-94. Höftberger R, Titulaer MJ, Sabater L, Dome B, Rózsás A, Hegedus B, et al. Encephalitis and GABA B receptor antibodies: Novel findings in a new case series of 20 patients. Neurology 2013;81:1500-6. Höftberger R, van Sonderen A, Leypoldt F, Houghton D, Geschwind M, Gelfand J, et al. Encephalitis and AMPA receptor antibodies: Novel findings in a case series of 22 patients. Neurology 2015;84:2403-12. Lee SK, Lee S-T. 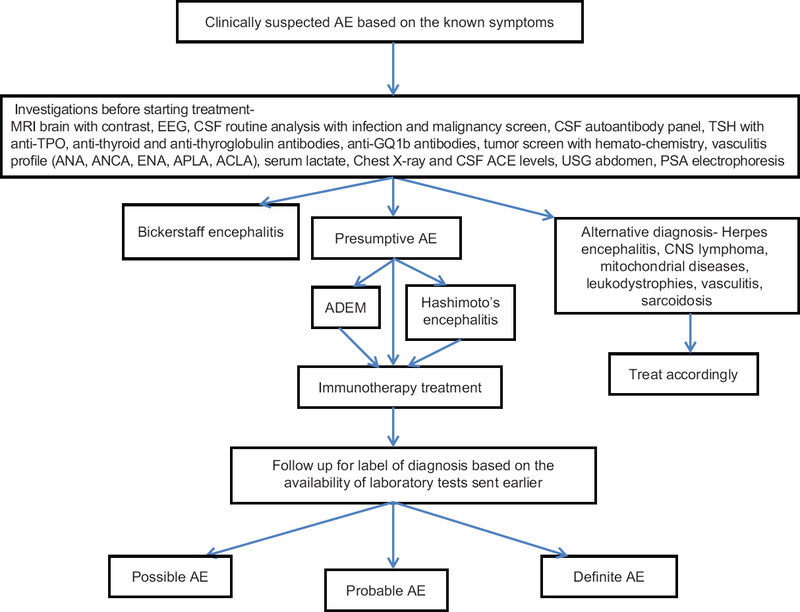 The laboratory diagnosis of autoimmune encephalitis. J Epilepsy Res 2016;6:45-52. Dalmau J, Furneaux HM, Gralla RJ, Kris MG, Posner JB. Detection of the anti-Hu antibody in the serum of patients with small cell lung cancer-a quantitative western blot analysis. Ann Neurol 1990;27:544-52. Kirshner HS. 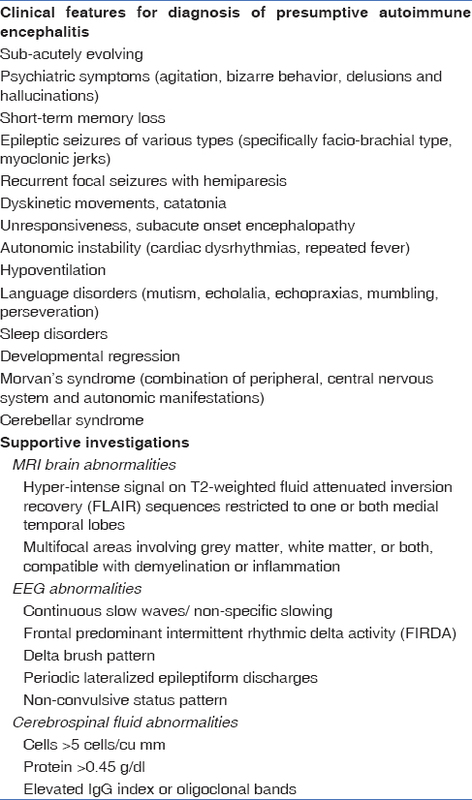 Hashimoto's encephalopathy: A brief review. Curr Neurol Neurosci Rep 2014;14:476. Tüzün E, Kürtüncü M, Lang B, Içöz S, Akman-Demir G, Eraksoy M, et al. Bickerstaff's encephalitis and Miller Fisher syndrome associated with voltage-gated potassium channel and novel anti-neuronal antibodies. Eur J Neurol 2010;17:1304-7. Meinck HM, Faber L, Morgenthaler N, Seissler J, Maile S, Butler M, et al. Antibodies against glutamic acid decarboxylase: Prevalence in neurological diseases. J Neurol Neurosurg Psychiatry 2001;71:100-3. Baysal-Kirac L, Tüzün E, Altindag E, Ekizoglu E, Kinay D, Bilgic B, et al. Are there any specific EEG findings in autoimmune epilepsies? Clin EEG Neurosci 2016;47:224-34. Tan KM, Lennon VA, Klein CJ, Boeve BF, Pittock SJ. Clinical spectrum of voltage-gated potassium channel autoimmunity. Neurology 2008;70:1883-90. McKeon A, Lennon VA, Pittock SJ. Immunotherapy-responsive dementias and encephalopathies. Continuum 2010;16:80-101. Lee WJ, Lee ST, Byun JI, Sunwoo JS, Kim TJ, Lim JA, et al. Rituximab treatment for autoimmune limbic encephalitis in an institutional cohort. Neurology 2016;86:1683-91. Nosadini M, Mohammad SS, Ramanathan S, Brilot F, Dale RC. Immune therapy in autoimmune encephalitis: A systematic review. Expert Rev Neurother 2015;15:1391-419. Titulaer MJ, McCracken L, Gabilondo I, Armangué T, Glaser C, Iizuka T, et al. Treatment and prognostic factors for long-term outcome in patients with anti-NMDA receptor encephalitis: An observational cohort study. Lancet Neurol 2013;12:157-65. Armangue T, Leypoldt F, Málaga I, Raspall-Chaure M, Marti I, Nichter C, et al. Herpes simplex virus encephalitis is a trigger of brain autoimmunity. Ann Neurol 2014; 75: 317–23. Hacohen Y, Deiva K, Pettingill P, Waters P, Siddiqui A, Chretien P, et al. N-methyl-D-aspartate receptor antibodies in post-herpes simplex virus encephalitis neurological relapse. Mov Disord 2014;29:90-6. Mohammad SS, Sinclair K, Pillai S, Merheb V, Aumann TD, Gill D, et al. Herpes simplex encephalitis relapse with chorea is associated with autoantibodies to N-Methyl-D-aspartate receptor or dopamine-2 receptor. Mov Disord 2014;29:117–22. Ran Y, Wang L, Zhang F, Ao R, Dong Z, Yu S. Anti-NMDAR encephalitis followed by seropositive neuromyelitis optica spectrum disorder: A case report and literature review. Clin Neurol Neurosurg 2017;155:75-82. Kano O, Arasaki K, Ikeda K, Aoyagi J, Shiraishi H, Motomura M, et al. Limbic encephalitis associated with systemic lupus erythematosus. Lupus 2009;18:1316-9. Diego Muñoz, Dora L. Hernández, Nelson Giraldo. Encefalitis límbica con fenotipo de encefalitis por anticuerpos contra receptores NMDA en paciente con diagnóstico de novo de lupus eritematoso sistémico. Reporte de caso. Revista Colombiana de Anestesiología 2017;45:59-65.